The last time New Leaf launched, WestJet and Air Canada responded by dropping their prices. That's what competition does. Keep an eye on YVR Deals for word of them doing so again! 2. Search for a flight from Abbotsford (YXX) or Victoria (YYJ) to one of the cities listed above. Start with a date that is July 25 or later. Edmonton, Alberta for $178 CAD roundtrip including taxes (or $168 CAD if you use the Flight Network promo code below). Try Wed/Sat to Wed/Sat dates in August, September, and October 2016. Winnipeg, Manitoba for $253 CAD roundtrip including taxes (or $243 CAD if you use the Flight Network promo code below). The only date combination currently showing this price is October 9 to 16, 2016 (over Thanksgiving). 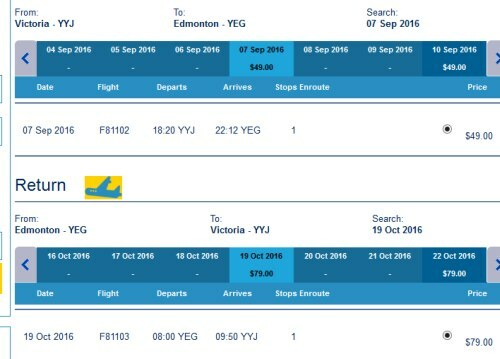 WestJet has dropped the price of their September flights from Vancouver to Winnipeg down to $254 CAD roundtrip including taxes. Click on the departure date box to open up the calendar and look for the $254 roundtrip date combinations in September 2016. Update 8/3 - WestJet has dropped the price of their flights from Abbotsford (YXX) to Edmonton (YEG) down to $140 to $166 CAD roundtrip including taxes. Update 8/27 - WestJet has dropped the price of their October flights from Vancouver to Toronto down to $383 CAD roundtrip including taxes, including some dates over Thanksgiving. The flights have a stop in Winnipeg each way. Update 8/30 - There's still a few WestJet flights in October from Abbotsford to Edmonton for $155 CAD roundtrip including taxes. The flights are non-stop. 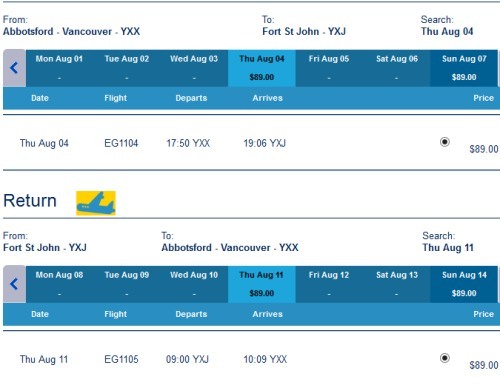 Update 8/31 - WestJet has dropped the price of a few October flights from Vancouver to Fort St. John down to $178 CAD roundtrip including taxes, including some dates over Thanksgiving. The flights are non-stop. 3. Click through from Skyscanner to the WestJet website for booking. This deal is also available on the reverse route, on the same dates, if you know anyone in Fort St. John that would like to visit Vancouver. 3. Try departure and return dates in September or October 2016. Look for the flights that are $49 there, and $79 back home. This deal is also available on the reverse route, on the same dates, if you know anyone in Edmonton that would like to visit Victoria. 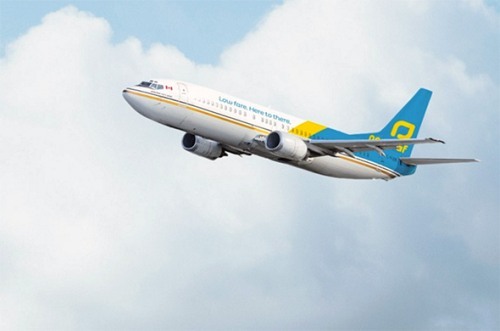 vancouver, yvr, flight deals, westjet, canada, victoria, yyj, abbotsford, yxx, alberta, north america, british columbia, bc, newleaf, winnipeg, ywg, manitoba, fort st john, yxj, edmonton, yeg, kamloops and yka.